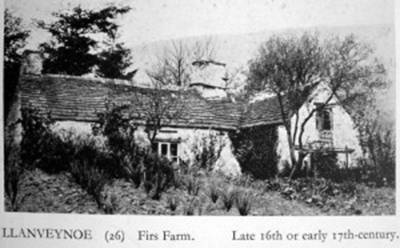 (26) Firs Farm (Plate 15), small farmhouse, nearly ¾ m. N.N.W. of (25), is of one storey with attics. The projecting porch on the S. side of the building is of the 17th century, and the house itself is probably of same date but has been largely remodelled and added to at a later date. The porch is gabled, and over the entrance is a stop-chamfered bressummer with a deep projecting stone string-course above.